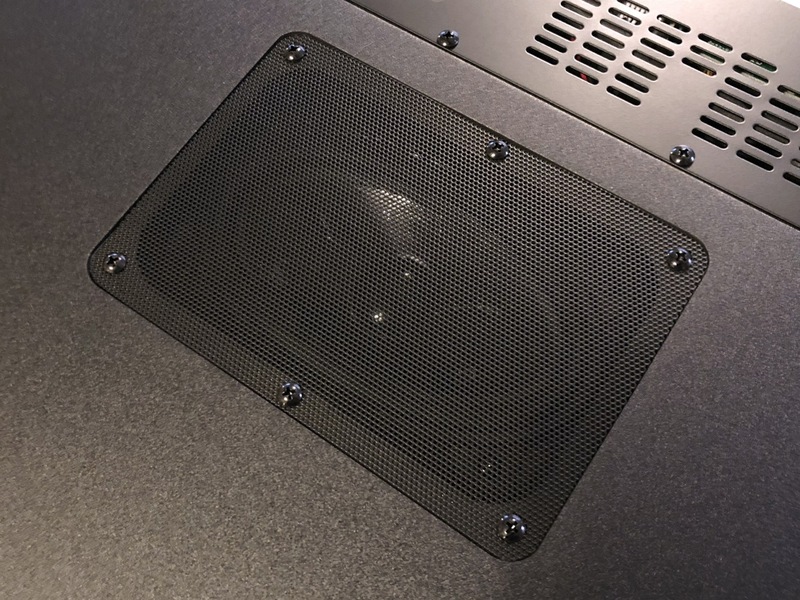 UK-based Q Audio is a relatively new speaker manufacturer. We haven’t heard much from them here in the USA, but they’ve just recently started pushing into the American market with their lines of floorstanding, bookshelf, and home theater audio gear. We’ve got a few of their products in for testing; first up is their M2 Soundbase, a versatile, compact home theater solution. The M2 Soundbase has a simple look that’s perfect for home theater integration. It’s low and wide at about 3.5 inches tall, 21 inches wide, and 13 inches deep. The front of the M2 is almost entirely covered in a simple speaker grille, with a tiny “Q” logo in the middle. Four feet raise it slightly, allowing for some airflow below the housing. On top are three tiny buttons — volume up, volume down, and a power button — with a small rectangular multi-color LED. Purely in matte black with minimal branding and no forward-facing lights, the M2 is not a product that’s looking to get noticed, but rather trying to blend in to your media center, letting the TV be the center of attention. 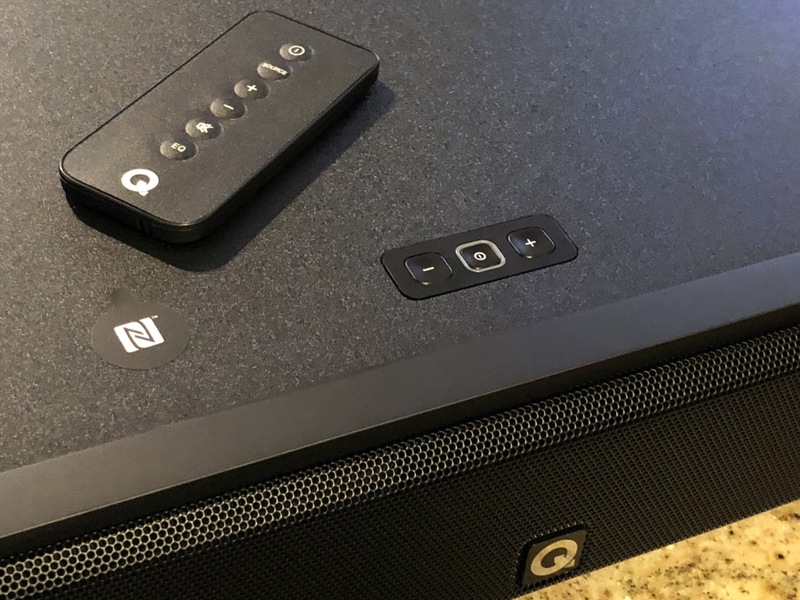 The M2 is aptly named as a sound “base” rather than a sound “bar” — its case is strong enough to support a fifty-five pound TV. Don’t let the M2’s simple looks fool you — there’s a lot of technology in this unassuming rectangular box. 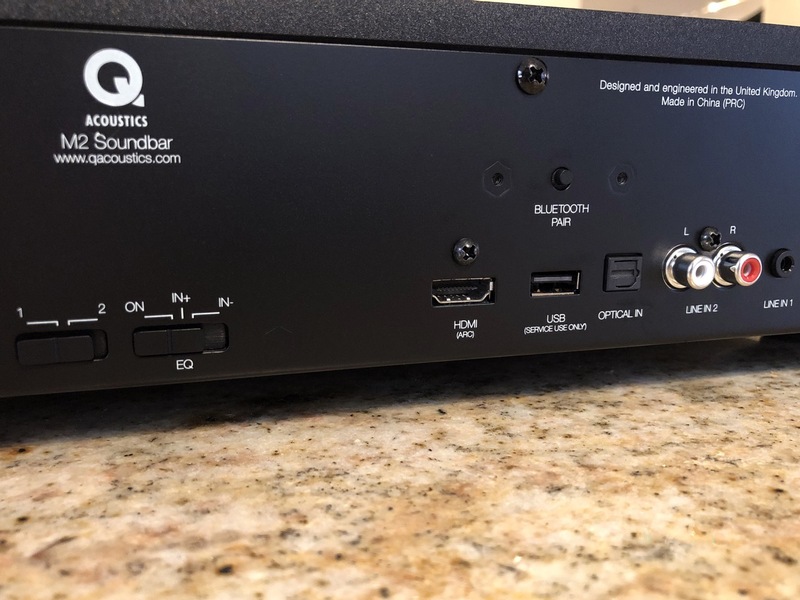 Connectivity options include two analog inputs (RCA and 3.5mm), HDMI, optical, and Bluetooth (aptX, MP3, and AAC are supported). Switches on the back of the M2 provide some thoughtful features to help the M2 integrate into your home theater system: one boosts amplification of weak analog input signals, and another adjusts EQ settings depending on whether you place the M2 in a small enclosed space, large cabinet, or on top of a media center. 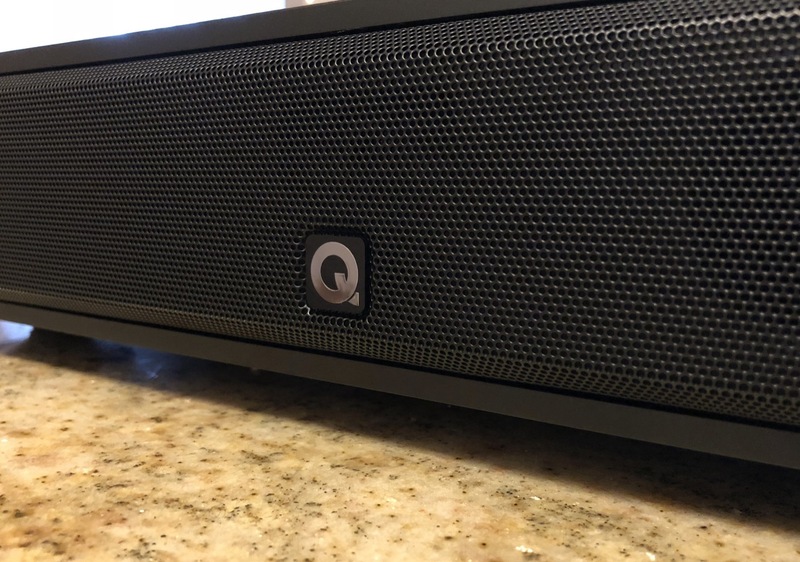 There’s no display on the M2, but we like how Q Acoustics communicates with the user — the tiny square LED ring around the power button changes color depending on what input is selected. Blue for Bluetooth, green for analog input, purple for HDMI, and white for optical; these tell the user exactly what information is needed without the eye-burning blue LEDs we see on so many other consumer electronics devices. In our testing, everything worked as expected. Bluetooth pairing was easy, using the small pairing button on the back of the M2; when using Bluetooth, the M2’s volume controls are linked to that of iOS. The M2 ships with a small six-button remote that can control volume, inputs, EQ, power, and mute. 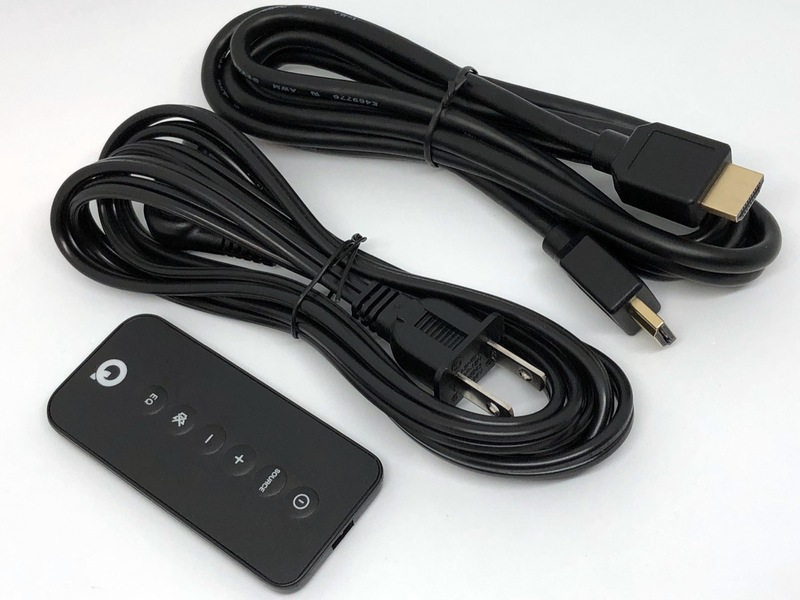 However, for general home theater use, we recommend connecting the M2 through HDMI to take advantage of the lesser-known technologies supported by that standard. Not only does HDMI provide a digital audio stream to the M2 (PCM only; surround sound is not supported), it also enables volume control with your TV remote (“ARC”, or Audio Return Channel) and power on/off control (“CEC”, or Consumer Electronics Control). Inside the M2 are two 58mm forward-firing drivers and a downward firing 100mm x 150mm woofer powered by an internal amplifier at max 20 watts and 40 watts respectively. The 58mm tweeters are BMR, or Balanced Mode Radiator drivers; rather than a traditional cone shape, these flat drivers provide about 180 degrees of dispersion despite their small size. We tried the M2 in small and medium-sized rooms, listening to music, watching movies, and playing video games. In general, we found that the M2 sounds best when it has some room to breathe, perhaps taking advantage of its broad dispersion. We were a bit underwhelmed with the M2’s midrange-heavy sound when playing music, but found it more than adequate for home theater use. The large cabinet seems to allow the M2 to achieve a good amount of bass response — far better than some ultra-slim soundbars we’ve heard. We like the M2 Soundbase. Though the M2 does not beat a higher-end multi-channel system, we think it does beat many of the similarly-priced soundbars we have used. 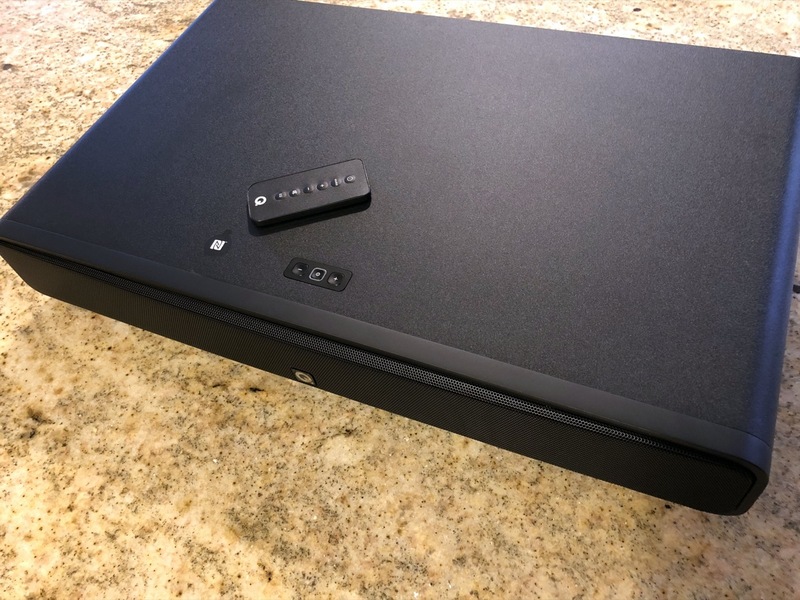 Its connectivity options and design are excellent, especially if your TV isn’t too heavy to mount on top of the M2’s case. If you’re looking for a discreet, feature-packed upgrade to your TV’s built-in speakers, we think the M2 Soundbase should be high on your list.